The Tech giant Apple has wanted to patent the new gesture unlock feature for their iOS devices which is very closed to the Android gesture method. The Apple’s has an idea is to make the matrix of dots configurable and to add invisible dots, by which the user would need to be aware of in order to enter the correct pattern. This new application of Apple has also mentioned different variations in the pattern entry, like different speeds and pauses, which can add an element, such as complexity, making it much harder for an unauthorized user to guess the pattern. The system also offered a pattern which has a strength meter, which is very much similar to the password strength meters that we are seeing in many sites. This Apple’s approach includes elements of Microsoft’s “picture passwords” as well. 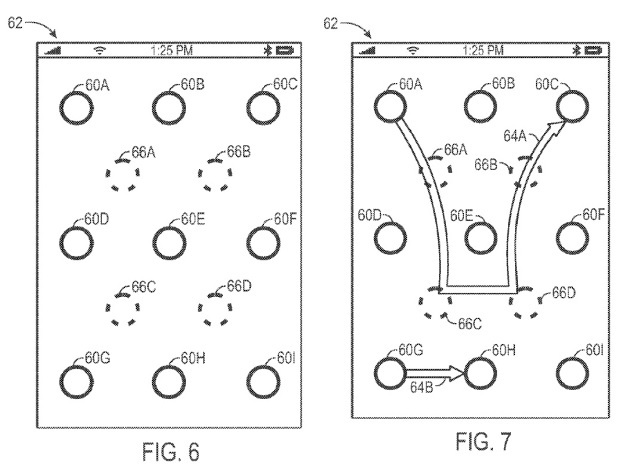 According to the new patent, the user can able to change the size of the points that they will be swiped, and rearrange the points, according to his choice so it makes it easier or harder to make visible swipes. According to the patent, you can change the size of the points which you will be swiping, and rearrange the points, so make it easier or harder to make certain visible swipes. The Apple will use this feature – as a TouchID, which provides a similar balance of convenience and security – but it is interesting to see another take on how gestures can be implemented in the security of the Apple devices.